Punjab, Pakistan, June 2009. The temperature is 45° and Asia has been out picking fruit for several hours. It's exhausting, sweaty work, but Asia and her husband have five children to feed. At midday she goes to the nearest well, picks up a cup and takes a long drink of cool water. She refills the cup, drinks some more and then offers it to another woman. Suddenly one of her fellow workers cries out that the water belongs to the Muslim women and that with her actions, Asia - who is Christian - has contaminated it. An argument ignites and in an instant, with one word, Asia's fate is sealed. 'Blasphemy!' someone shouts. In Pakistan this is a charge punishable by death. 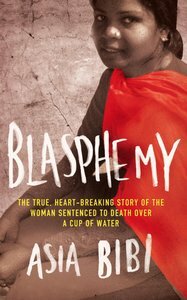 First attacked by a mob, Asia was soon after thrown into prison and then sentenced to be hanged. Since then she has been kept in a windowless cell. Her family have had to flee their village, under threat from vengeful extremists. In the wave of accusation that followed, only two public figures came to Asia's defence: the Muslim governor of the Punjab and Pakistan's Christian Minister for Minorities. Both have since been brutally murdered. Here, in equal measures shocking and inspiring, Asia Bibi, who has become a symbol for everyone concerned with ending the violence committed in the name of religion, bravely speaks to us from her prison cell.